Dad, where does movie music come from? I expect that every film music buff has an interesting tale about what first drew them into this modern form of musical expression, and mine is probably not all that different. Born in 1954, my earliest years were spent listening to children's classical music, like Prokofiev's Peter and the Wolf, my dad's Glenn Miller records, and an encyclopedic-sized anthology of Western (as opposed to Eastern) music released on 10 LPs by RCA for Reader's Digest. (It was called Popular Music that Will Live Forever.) I would stack 2 or 3 records on the turntable's spindle, watch one drop, and see the tone arm swing into place over the first track. (I really miss the mechanics of old phonographs.) So, while my friends obsessed over The Beatles and rock and roll, I was discovering film music, songs from musicals, Sousa marches, classical works, international selections, and American folk music. The anthology was impeccably produced, often featuring The New Symphony Orchestra of London under the baton of the French composer/conductor, Rene Leibowitz. By the age of 9, I was deep into the Colonel Bogey March (used in The Bridge on the River Kwai), Begin the Beguine (used in Night and Day), March of the Siamese Children (from The King and I), Do Not Forsake Me Oh My Darling (from High Noon), Laura, and Around the World in 80 Days. I read and re-read all about these selections in the handsome anthology booklet, but I had never seen any of the films in which these great pieces of music appeared--until much later. Truthfully, before this, it never occurred to me that people actually wrote music for movies. I always assumed that someone found some music they liked, and just put it in the film! (Sadly, I knew even less about how movies were made.) But this changed when my dad took me and my brother to see The Magnificent Seven at the Terrace Drive-in Theater on old Route 66. The action and the locations and the music simply exploded from the screen--and the sensation was, well, magnificent. At some point in the film, my dad explained that the music was written specifically for this movie by a composer, and there was my epiphany. A year or two later, I was exposed to my first movie soundtrack when a school buddy played tracks from Goldfinger on his dad's reel-to-reel. It was a knockout punch! John Barry's music was hip, raucous, loud, and yet somehow tighter and more polished than rock and roll, which I was slowly allowing into my musical inner sanctum. Barry’s music featured loud, trebly electric guitars, jazz and rock drum charts, and a horn section that could raise the rafters. And even though I had not yet seen any of the James Bond films, Barry's music was a conduit for imagining all kinds of suspenseful and dangerous situations in my pretend world. The James Bond Theme (yes, I know it's credited to Monty Norman) became that unconscious mantra that played in my head whenever my friends and I aimed our fingers and fired at each other in the back yard. But this youthful obsession turned out to be just a preview of coming attractions. The way I discovered Elmer Bernstein was roundabout. 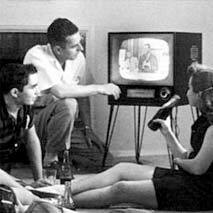 With my mom and dad on the couch and my brother and me plopped on the floor before the giant black and white Zenith, I would often take notice of some of the catchy theme music emanating from the tiny TV speaker. I distinctly remember loving the music to the biography series, Hollywood and the Stars, the National Geographic theme song, the Marlboro cigarette ad's tune (which was strangely familiar), and the main title music to films like Baby, the Rain Must Fall. Finally, I decided it was important to find out who was creating this music, so I began reading the credits to movies and shows broadcast on TV. With few exceptions, there was one man behind all this great music—Elmer Bernstein. I loved those incredible melodies, those wonderful brass fanfares, the staccato, syncopated chords, the charging ostinatos, the countermelodies weaving in and out of the central themes. It opened up a whole new world for me. If John Barry was the rock star of movie music, Bernstein was the Master. Before long I took to placing my Craig mini tape recorder (yes, just like the one used on TV's Mission Impossible) up to the TV speaker and recording main title sequences and long musical passages in films coming through the tube. In honor of my new obsession, I finally saved up $2.99 to buy the United Artist long player called the Best Original Soundtracks and Great Themes from the Motion Pictures (UA could have used a copy editor). I would estimate that I played this record 200 times, memorizing selections that included Return of the Seven, Hawaii, Cast a Giant Shadow, plus the music of Johnny Mandel, Frank Cordell, Neal Hefti, and Francis Lai. (From my bedroom, with baton in hand, I conducted the pieces with grand theatricality to an adoring audience!) I was absolutely hooked! 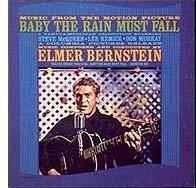 This started a 45-year love of film music and, more importantly, the music of Elmer Bernstein. Advance more than a decade and you would have found me sitting in my Music Theory or Ear Training classes at the University of New Mexico, practicing the piano in the Fine Arts Building catacombs, or watching German Expressionist films in the Student Union theater for my Film Theory class. This education only enhanced my passion for film music and EB's music specifically--as well as a growing fascination for cinema. And even though I eventually changed my major to English, I built a foundation of knowledge and appreciation that has carried on into my middle years and beyond. This foundation finally afforded me the requisite tools to discuss and celebrate the film music of my greatest hero. Notably, all these composers went on to compose great music well into the new millennium. And I believe that Elmer was the Best of the Best, and that's why I have created this tribute site to honor him and his rich legacy.